Open this link for a great overview about Oregon’s forestry and forest products industry: Oregon Forest Facts & Figures 2013. It now takes one tree every year for every man, woman and child to meet their needs for paper, packaging, fiber compounds, lumber and panel products. Annually, every American uses a tree 16 inches in diameter by 100 foot tall. Your tree--if harvested in Oregon--is logged using the most careful environmental protections in the world. Before advances in forest technology and recycling over the past decade, you used more than one tree. A growing American population uses 2% more paper each year--more than the rate of increased recycling. Americans now recover over 46% of all paper used. To make your paper, Western paper mills use primarily waste wood, recycled fiber, and logs too small or defective for other uses. Special Forests Already Preserved -- How Much is Enough? About 11 million acres of Oregon Forestland (40% of forests, all ownerships) is now preserved from commercial timber harvest in old growth reserves, stream corridors, wetlands, wildlife habitats, natural areas, recreation zones, wilderness, parks, some roadless areas, and other withdrawals. Strict forest laws assure trees are planted and growing to replace timber harvested. Oregon has the highest private land reforestation compliance rate in the nation -- averaging 97%. For example, Oregon's landowners planted trees on a total of 150,879 acres in 1996 -- over half of this reforestation was done by private owners. More than 40 million seedlings were planted. That's 12 seedlings for every Oregonian. Wood is produced by trees in a forest, using free energy from the sun, carbon dioxide from the air, plus water and nutrients from the soil. Healthy managed forests generate far more pure oxygen, returned to the atmosphere, than do old slow growing forests. Wood -- beautiful, strong, natural, renewable, recyclable, energy efficient, easy-to-use wood. No other resource on earth can match its environmental advantages. Clearly, the world should be using more wood, not less. More trees are growing in the nation's forests than at any time since the early 1900's. In 1900, forest growth rates were a small fraction of harvest. Today, annual forest growth exceeds harvest by 33%. Net annual growth has increased 55% since 1952, and growth per acre has increased 62%. Nationally, standing timber volume per acre in US forests is 33% greater than in 1952. In national forests, annual growth now exceeds harvest by more than 100%. Oregon's future does not require a trade-off between wood products and the new growth industries, such as high-tech. Oregon needs both. In fact, to favor either at the expense of the other is to imperil statewide economic diversity. Former Oregon State University forest economist Dr. John Beuter, in his 1995 report, Legacy and Promise, found that Oregon can sustain an ample harvest AND protect other forest values. 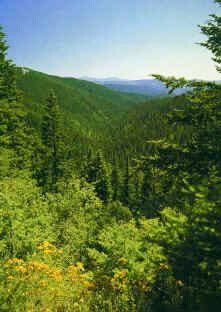 Beuter asserts that properly managed Oregon forests could support a sustainable annual harvest of at least 5 to 7.5 billion board feet with much less environmental impact than occurred in the past, and a significant improvement in the protection of wildlife habitat, watersheds, and scenery. 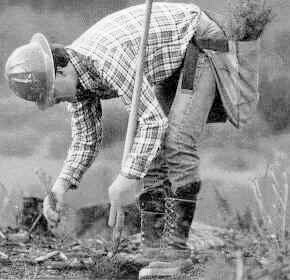 Oregon State University studies in 1976 & '89 concluded that Oregon forests could maintain their 8 billion board foot harvest level (1970's) indefinitely, because growth and timber volumes exceeded this rate. A majority of forest scientists, ecologists and biologists agree that clearcutting is among several tools carefully applied to renew aging or damaged forests. In Oregon, only 14% of the area harvested each year is done by clearcutting, and 86% of the area harvested each year is done by thinning. Industrial and small woodlot owners clearcut (15%) about the same rate as public forest managers (11%). Today's modern clearcut retains several standing and downed trees to provide diversity. Since 1994, Oregon loggers harvested only 4 billion board feet of timber annually, enough wood fiber to produce 4 million tons of paper products and build 267,000 homes. Although Oregon forest growth exceeds timber harvest and we have more timber than we did in 1952, conflicting federal laws and logging prohibitions have stalled harvest. Oregon harvest this low is unprecedented since the depression-era 1930's. Between 1940 and 1990, Oregon harvest averaged 7 to 9 billion bi-annually. Who decides when and how trees are harvested; and who does all the work to "manage" a forest? During the course of a single harvest and reforestation operation, as many as 33 forest professionals may be directly involved in planning and implementation in a 5-year period. Here's a list of a few forest stewards who care for Oregon's forest during a logging operation, but not limited to: owner/manager, preparation forester, silviculturist, hydrologist, fish biologist, wildlife biologist, ecologist, soil specialist, geo-technical engineer, road engineer, logging engineer, archeologist, entomologist, pathologist, fuels specialist, recreation planner, landscape architect, surveyor, land use specialist, professional loggers (timber falling, yarding, trucking), cruiser, appraiser, road construction contractor, road maintenance operator, contractors forester, forest practices forester, forestry service contractor, tree planting contractor, fire contractor, and monitoring provider.